I am working my way patiently along the edge of the Noarlunga reef-on the shallow side near the jetty. The water is no more than a couple of metres deep and surprisingly clear. 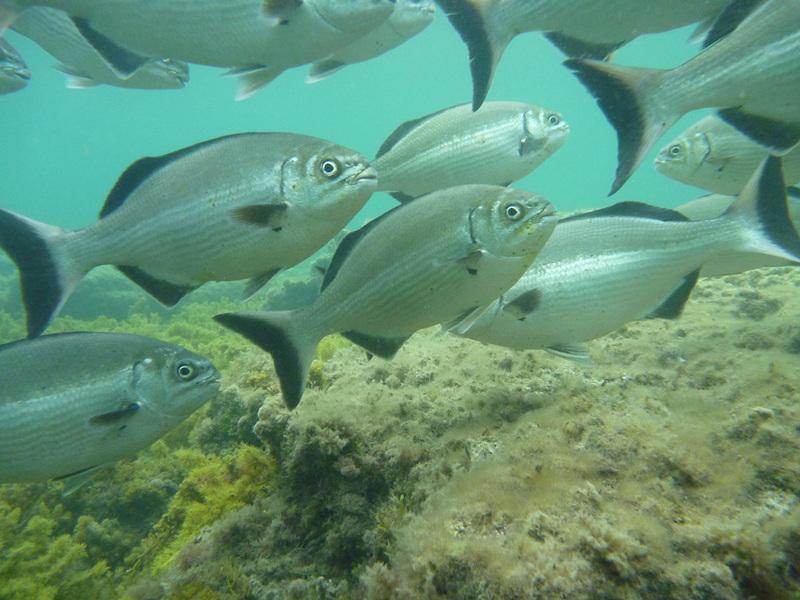 Small schools of mullet are congregating near the surface, their silver sides reflecting the light with sudden bright flashes. Just below me there are several recesses that cut under the rocks and I can see some movement in one: perhaps a leatherjacket or even some bullseyes. 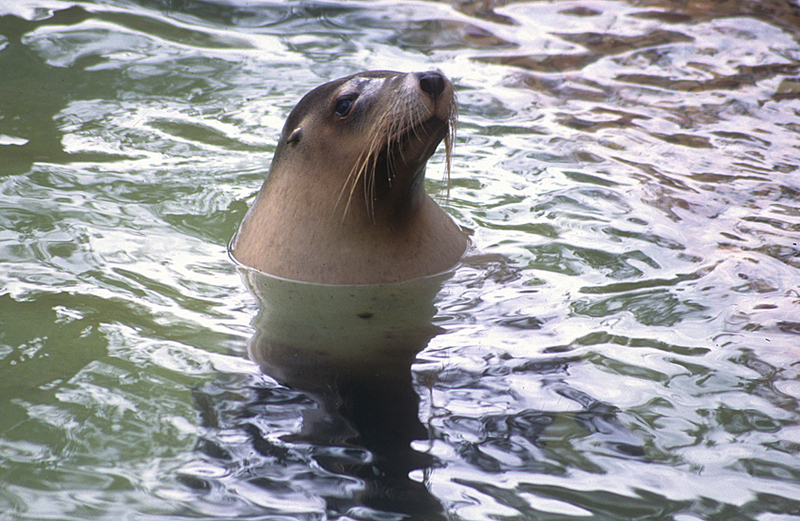 I swim down and hold onto a nearby rock until my eyes adjust to the light. To my delight my encounter is a little more exotic, a giant cuttlefish is hovering above the sandy substrate patiently waiting for some unfortunate critter to come near its temporary lair. Length: mantle or body to 50cm. There is a flash of light in the dark waters surrounding me. I point the camera and fire off a few frames hoping for the best. The squid (Southern Calamari) have been accumulating beneath the Second Valley Jetty, attracted by fluorescent lures cast by fishers. They seem indifferent to my presence. 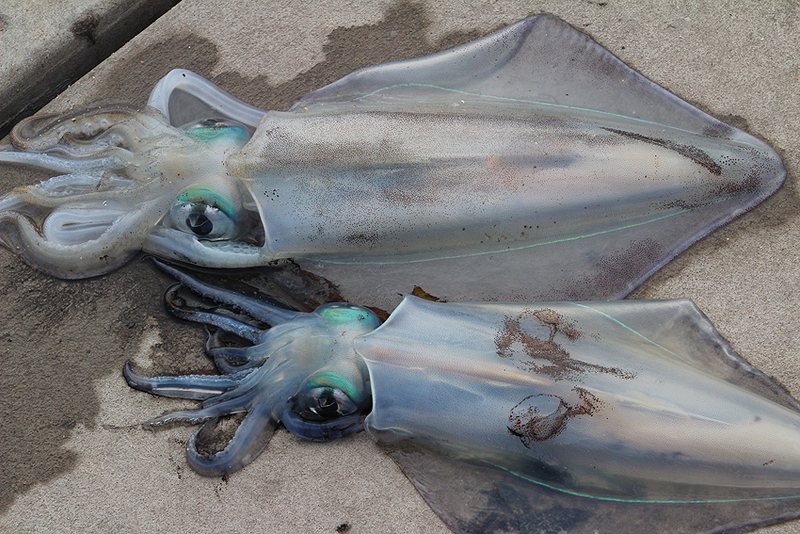 The next morning I venture into deeper waters and catch sight of a group of squid gliding through the ocean. Nice image. And later that day I drive through to Normanville and enjoy ‘Salt and Pepper Squid’ a South Aussie favourite. Yes! 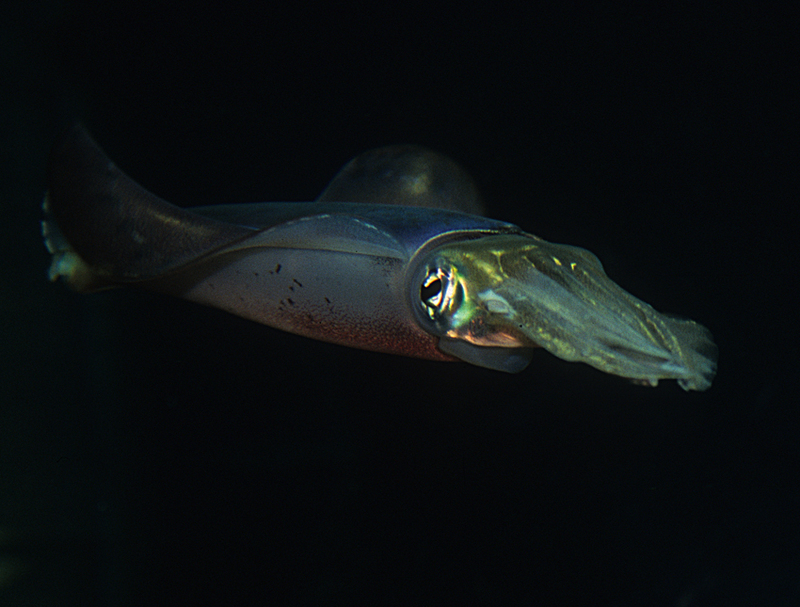 The humble squid, is an icon of Southern Australia’s marine culture be it a fascinating animal to study, an angler’s quarry or a fine meal. 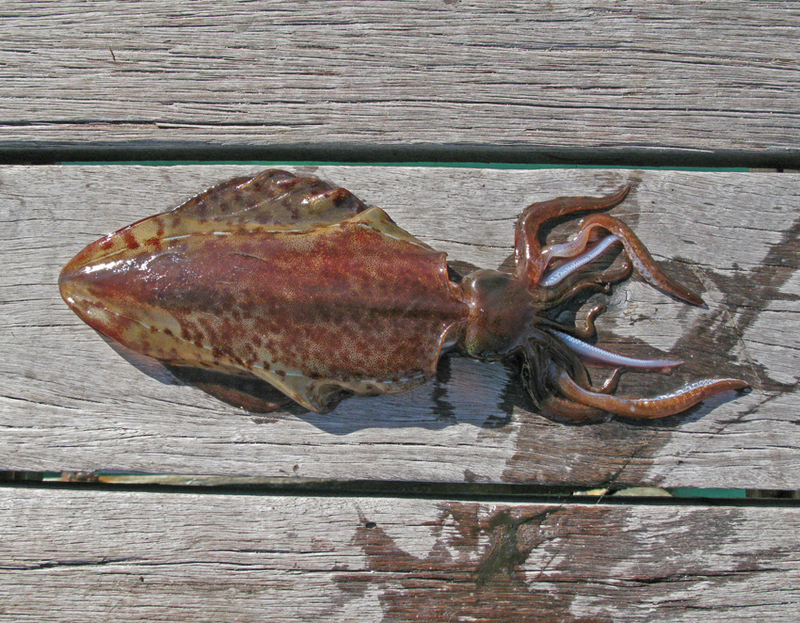 Size: Length of body (mantle) up to 40 cm. 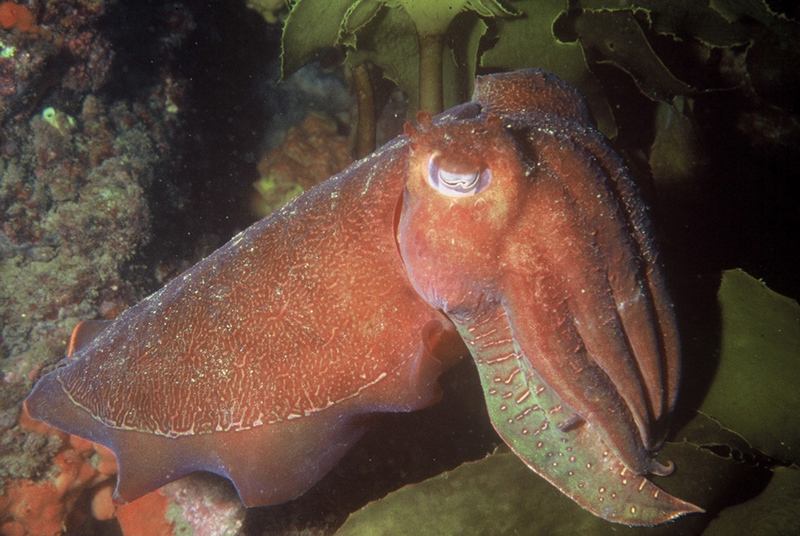 In my next blog we will explore some of the squid’s close relatives; cuttlefish and octopus. The road drops sharply from a cloud enveloped ridge top to the beach then emerges from the mist alongside a small creek. The sky is clearer close to the ocean and I can see the familiar outline of the steep cliffs and the twin jetties that jut out into the gulf. It is a chilly winter’s morning and my hands are cold as I organise my back pack and cameras ready for a stroll along the seafront. Two large birds are flying slowly along the beach front; in the early morning light they seem to resemble pacific gulls, a fairly common species along this part of the coast. I track the seabirds with my long lens and fire off a series of shots and quickly review them. Although the light mist obscured the birds’ features to the naked eye the captured images reveal a pleasant surprise. 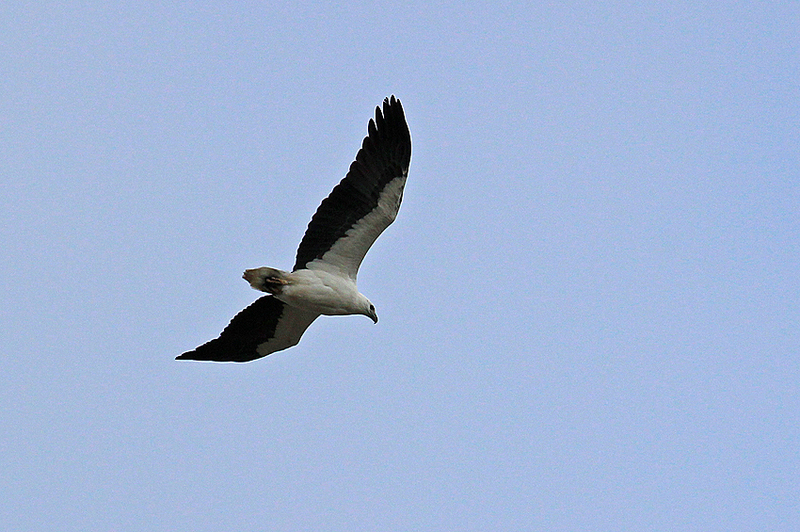 The wing feathers, tail shape and characteristically curved beak indicate a far more interesting and less common bird….the white breasted sea eagle. A little further down the coast I can see the eagles rise up on a thermal alongside the cliffs as they soar in tight spirals before resuming their beach patrol. 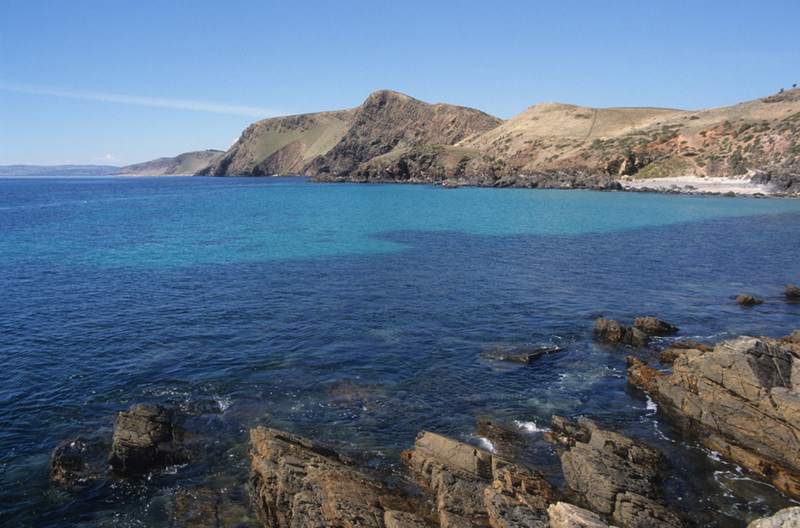 The beach with its high cliffs, creek and mining jetty define one of the Fleurieu Peninsula’s most interesting and historic locations; Rapid Bay. It was here that Adelaide’s original surveyor Colonel Light anchored his brig ‘The Rapid’ in the sheltered bay uttering the words “I have hardly seen a place I like better”. 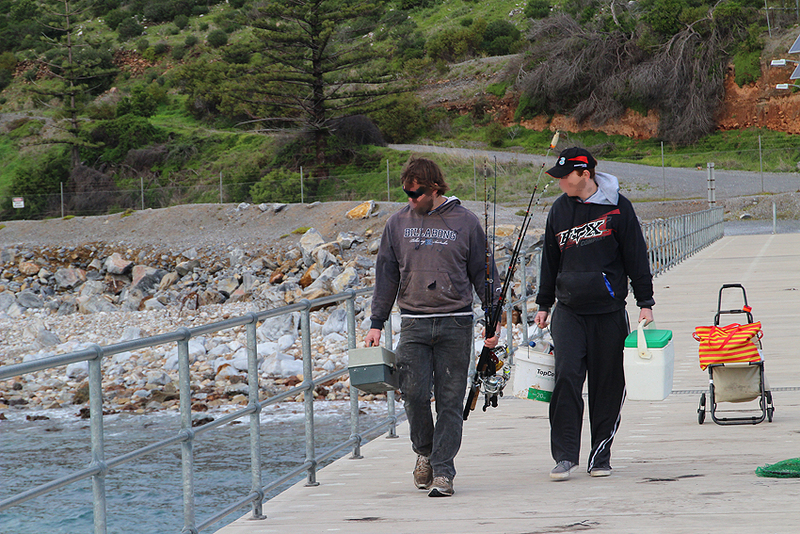 Only 100 kms south of Adelaide, Rapid Bay is a prime location for divers and anglers. It is also holds a significant place in the lore of several local Aboriginal peoples; a feature of the area that I will explore in more depth at a later date. From the beach front I walk along a short dirt road to the jetty. A couple of fishers tell me that a sea lion has been hunting in the shallows between the new and old jetty. After a few minutes a sleek grey shape twists and turns in the water only a dozen metres away and a whiskery face pops up, surveys the surface and is gone as suddenly as it appeared. The anglers tell me that they have tossed a couple of squid to it and that the sealion has been around the jetties for the last couple of days. I watch the men jigging for squid for a few more minutes before returning to the car which is parked near the creek. As I pack up my gear I can hear the sound of finches in the bushes and reeds but it is difficult to focus on the tiny birds especially in these low light conditions. 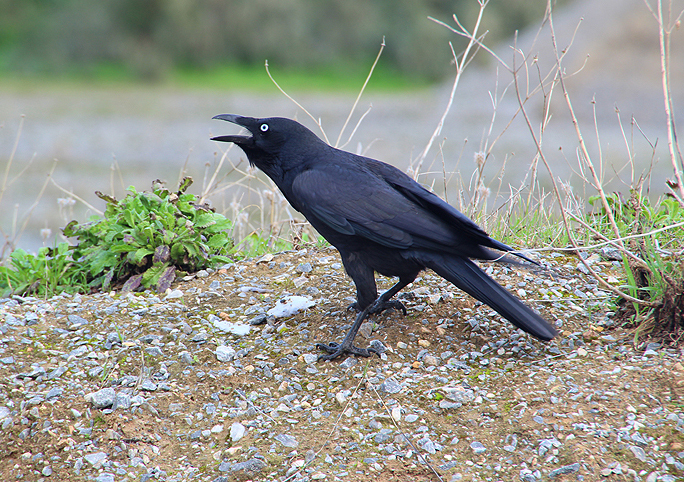 While I am concentrating on the tiny birds a large raven appears on the nearby embankment with a piece of squid in its beak and proceeds to tear the rubbery flesh apart while keeping a wary eye on me and croaking out a few warning calls to any other would be scavengers that might fancy a calamari entree. Eagles, sealions, squid and even a dolphin that cruises past as I leave the jetty; it has been a morning of predators and scavengers both aquatic and aerial. And now it is my turn to grab a bite to eat. Leonard’s Mill, a renovated flour mill, is one of my favourite dining spots and on the main highway to town a mere 15 kms from the Rapid Bay turn off. Their calamari is on the menu as salt and pepper squid and best enjoyed with a fine white wine from the local vineyards. This week’s post is courtesy of a chilly winter dive and a pleasant day’s drive to one of my favourite childhood haunts, Second Valley. In 1836 Colonel Light, the founder of Adelaide, was searching for a good location for South Australia’s new capital city. He sailed his ship, the Rapid, into a sheltered bay with a fresh water stream that flowed in from a fertile valley. Light named the bay after the vessel. 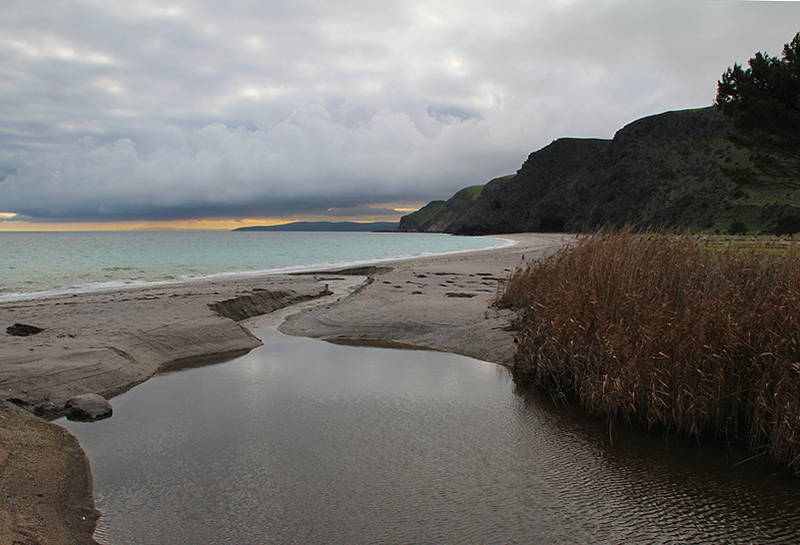 The second little cove that he discovered was just a few miles north towards the present location of Adelaide and was simply known as Second Valley. 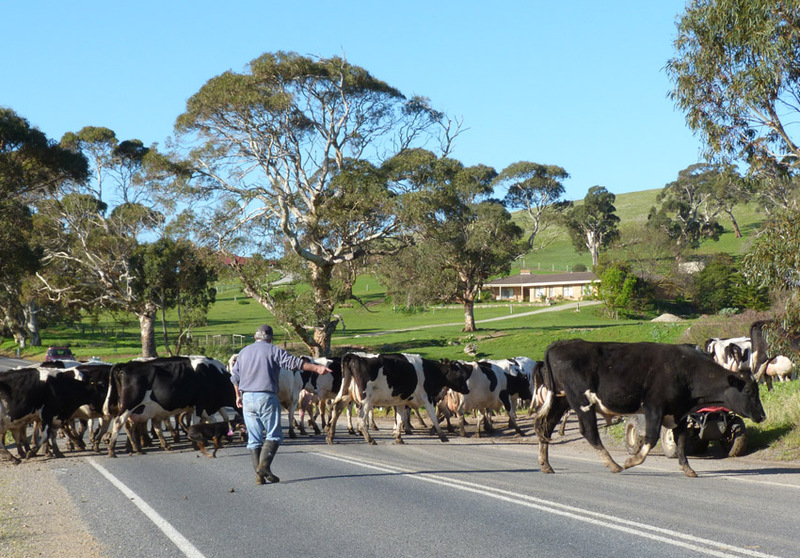 Second Valley is a one and a half hour drive from the city centre along the Fleurieu Peninsula’s south coast road. The dairy farms that lie amongst the rolling hills, large expanses of open woodland, and vineyards make it a recreational drive worth undertaking for its own sake. But for the wildlife enthusiast both drive and destination are even more enthralling. 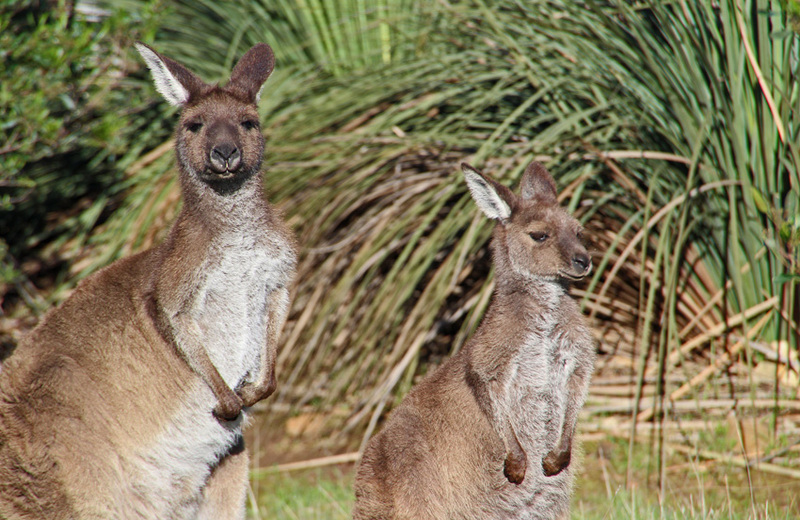 The farms and bushland support a healthy population of western grey kangaroos that are often visible from the road. Rosellas, various cockatoos, lorikeets and a host of other bird species are also common throughout the year. However Second Valley’s real charm lies beneath its pristine waters. The sheltered little bay is enclosed by limestone hills and coastal cliffs . It boasts an exquisite little beach and miniature rocky headland which is bisected by an old wooden jetty. Small boats can be launched from the beach but the marine environment is just as easily accessed from the beach, jetty and rocks for shore based divers. It is, in my experience, one of the best scuba and snorkelling locations that I have encountered anywhere in the world. A place where a novice snorkeler can swim amongst shallow rocky reefs in water they can stand up in or a more adventurous diver can swim a short distance and be next to a cliff face that drops away into 10 metres of water. Below the water there is a diverse range of habitats to explore ranging from limestone caves and ledges, to rocky reefs, seagrass meadows and open expanses of white rippled sand. There is always a wide selection of marine life to enjoy. Over the years I have encountered everything from huge eagle rays to schools of iridescent squid on a night dive and once I came across an elephant shark lazily gliding across the segrass as it came into the shallow bay to breed. Although the balmy days of summer are the ideal weather for a dip in the ocean the winter months often produce long fine breaks when the sea is calm and visibility excellent. On this particular occasion I was lucky enough to encounter a couple of large cuttlefish under a ledge and a school of silver drummer milled around me on the edge of the rocky outcrop. On any typical dive, either snorkelling or with scuba, I would expect to sight at least 30 different species of fish and a multitude of invertebrates. This dive was no exception. As always I hope you enjoyed the pictures and anecdotes and that they encourage you to come and enjoy our unique scenery and wildlife. This week has been hot with temperatures hovering around the mid 30s- perfect weather for a dip in the ocean. Although our urban beaches are perfect for swimming it is the more rugged coastline further south that always attracts my attention. As a keen snorkeler and underwater photographer the cliffs, headlands and rocky reefs, interspersed with fine, sandy beaches, create a tempting environment for anyone interested in marine life. Consequently, last Saturday morning found me donning my summer wet suit and sliding into the water under the Port Noarlunga jetty; a favourite dive location only a 45 minute drive south of Adelaide’s CBD. Like many of South Australia’s jetties; this one is the legacy of bygone days when wooden ketches collected grain from coastal farming communities. The old wooden structure juts out from a sheltered beach and is sandwiched between low limestone cliffs and an estuary. Two hundred metres out to sea it intersects a reef that runs parallel to the shore. Although the reef is a marine sanctuary there is limited fishing allowed along the first three quarters of the jetty. Most divers go to the end of the jetty and drop straight onto the reef. However, on this occasion I had decided to swim under the jetty and look at the way the environment and marine life changes with depth and proximity to the reef. The first few metres were quite a surprise. I had expected bare sand and little life. Instead I found quite a community of organisms in the shallow warm water. Small schools of mullet and yellowfin-whiting and some bream were patrolling the sandy bottom searching for small crustaceans and worms. A few large razorfish, a fan shaped mollusc that buries its pointed end in the sand, protruded amongst the small outcrops of rock and sparse seagrass patches while several sand crabs scuttled for cover in the weed as I swam over them. In the shallow zone, the jetty piles are constantly exposed to air and sun as the tides and winds vary. Only a few grey snail shells and worm tubes clung to them finding moisture and protection in the cracks in the wood. As the water became deeper a coating of small black mussels shaded the grey wood of the piles and a mixed growth of algae, sea squirts, sponges and other encrusting organisms started to appear. In the open water schools of baitfish would occasionally appear in tightly choreographed formations; a group strategy evolved for minimising successful attacks by predators. Closer to the surface, I caught sight of the occasional garfish and even a small group of squid chasing after a fisherman’s lure. As I approached the end of the jetty, the character of the environment changed dramatically. The growth of invertebrates covering the wooden supports had thickened and a veritable garden of different organisms of every texture and colour imaginable competed for space and food. Small patterned fish and shrimps darted amongst these marine jungles and an occasional starfish also moved slowly though them in search of prey. The baitfish had been replaced by a mixed school of sea sweep and old wives. When I reached the end of the jetty I used the aluminium dive ladder to climb out and sat for a while on the wooden walkway and watched a few divers exploring the reef. A quick glance at my dive watch indicated that I had been in the water for well over an hour. The time had passed quickly and I had been more than pleasantly surprised by the marine life under the jetty….worth another visit.